Although this blog is for stuff I make at home, if you are a teacher then you know that home and work are essentially the same thing, especially when you are grading exams. 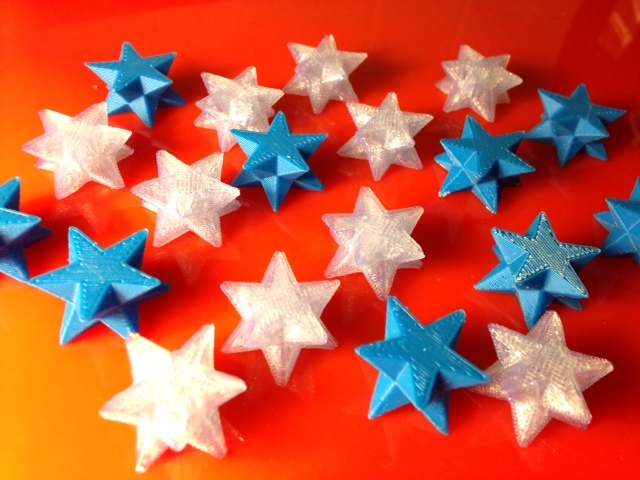 It's the season for that first calculus exam, and to reward the students with B or higher grades I made some 3D stars. Settings: The clear ones were made with a Replicator 2 on MakerWare "low" setting, with 10 stars taking just 34 minutes. The blue ones were made with an Afinia H-Series on their 3D sofware's .2mm setting, and otherwise default settings and "normal" speed, with 9 stars taking 56 minutes. To be fair, MakerWare's "low" setting is a .3 mm setting and comparable to Afinia's "fast" on that resolution. Technical notes: I did not have good luck printing full stellated dodecahera at this size, which is why I cut off the top and bottom. This allows much better adherence to the build platform. In the end I think this is actually better because they look much more like stars. The stellated dodecahedra came from Mathematica's PolyhedronData command. Teacher note: alas, the picture above overestimates the number of B-and-above grades on my first calculus exam by 200 percent.